On my journey with pastels I have tried various supports to paint on including velour and although this does give a wonderful fur effect I much prefer using Clairefontaine’s Pastelmat card and board. It’s a new concept as the pastel adheres so well to this new paper that you don’t need to use a fixative between each layer. Pastelmat has a coarser surface than velour but a softer surface than sandpaper. 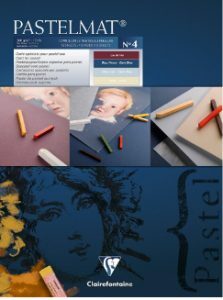 Pastelmat’s 360lb card is made from a fine coating of cellulose fibres that has the ability to grab and hold really soft pastels such as Unison. 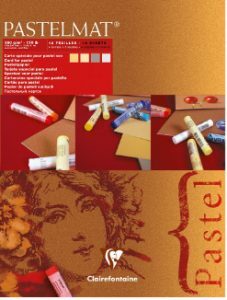 It comes in 8 colours: warm, cool or achromatic suitable for every kind of subject with dry pastels. I tend to use their light grey, sand and occasionally white. Each sheet in the pads is protected by a crystal paper divider. I have used the pads but prefer to buy 50x70cm sheets that I can cut to size. It also comes as a board which should then make framing easier. Below are two of the different pads that are available. All in all a fabulous and versatile surface to paint on. As you can tell I love it.